Choosing a financial planner can be a tedious process. Finding someone with the experience and expertise to make your money work for you is a big job that shouldn’t be entrusted to just anyone. Whether you’re saving for retirement, growing your family, starting a new business, or enjoying your non-working days with family and friends, a financial planner can help you achieve your goals. 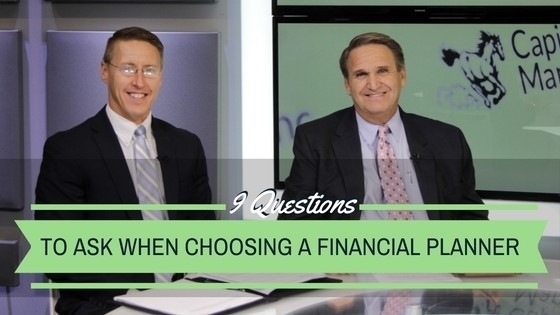 We recently sat down with two of our Capital Asset Management team members, Douglas Oliver, CFP, and Justin Klein, CFP, to talk about the important questions to ask when choosing a financial planner and how they would answer them if a client asked. 1. What experiences and qualifications do you have? Doug and Justin have been working as independent financial advisors for nearly 50 years combined. Both are Certified Financial Planners. The Capital Asset Management team offers a wide variety of services to clients in the financial planning and personal finance realm. Additionally, they have relationships with professionals in tax, accounting, law, and banking. 3. What is your approach to financial planning? Doug and Justin utilize the six-step financial planning process which includes establishing a relationship, gathering information, analyzing and evaluating a client’s current financial status, developing and communicating recommendations, implementing the recommendations, and monitoring the recommendations. 4. Will you be the only person working with me? The Capital Asset Management team provides a professional staff to assist in developing and carrying out financial planning recommendations for clients. While there is a support team on hand, Doug and Justin always review and monitor client’s situations and investments. 5. How will I pay for your services? 6. How much do you typically charge? The amount clients pay depends on their financial needs. Our team works to provide clients an estimate of potential costs before any work is implemented. “For cost-conscious clients, we offer an initial assessment on our website so they can see their situation prior to any commitments,” explains Justin. 7. Could anyone besides me benefit from your recommendations? Based on the Certified Financial Planner Board’s Rules of Conduct, all CFP professionals who provide financial planning or materials to a client owe that client the care of a fiduciary. For those unfamiliar with the term fiduciary, it’s defined as someone who acts in utmost good faith, in a manner he/she believes to be in the best interest of the client. “What is ‘best’ for the client depends on each client’s individual situation. However, the professional must always place the client’s interest ahead of the professional’s own,” says Doug. 8. Have you ever been publically disciplined for any unlawful or unethical action in your professional career? To check any financial planner’s background and professional history, Certified Financial Planner Board of Standards or FINRA’s Broker Check are great resources. 9. Can I have it in writing? Although any client can review a financial planner’s background by visiting the websites listed in answer 8, documentation can be provided per a client’s request. When planning for your financial future, whatever that might be, it’s important to be well-educated when choosing a financial planner. To learn more about our Capital Asset Management team or how we can help your money work for you, contact us today or take our self-directed financial planning assessment.